I've never actually made real egg nogg before and it was much better than I expected. It's also pretty easy, and very nutritious. This is something I plan on enjoying throughout the year! Separate the eggs and beat egg whites until soft peaks form. In another bowl, beat the yolks with the honey, just until frothy and well mixed. I personally feel that egg nog needs very little sweetness to be delicious, so I use only a few T of honey. If you are using kefir you may want to add more honey. Gently fold the yolk mixture into the beaten whites. Then fold in the coconut milk or kefir. Fold in bourbon to taste if you are using it. After you pour it into cups, sprinkle the top with nutmeg. This recipe makes quite a bit and easily serves 4. Hi, is this is the really thick coconut milk? 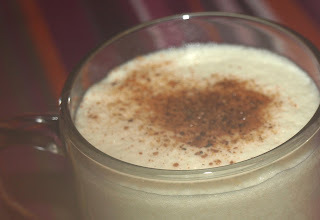 I have been craving eggnog and this looks and sounds delicious! Oooh, thank you for this. I missed egg nog at Christmas last year, will file this away for dairy-free egg nog at christmas this year! Can I make this a day ahead of time and it still be delicious? This was not one of my recipes, but I have made eggnog before, and it has kept fine in the refrigerator for a day or two, but please chill it immediately after making it. It might need to be whisked again before serving.